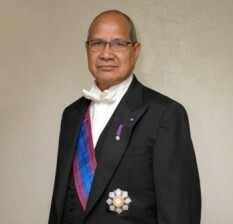 On the 19th of May last, the Timor-Leste Ambassador, Justino Guterres, was distinguished by the Vatican with the highest Decoration from the Holly See, A Magna Cruce Ordinis Piani. The persons rewarded with this Order enjoy the privileg of knights that is transmissible to their descendents. Instituted by Pope Pius IV, and after centuries taken up again by Pope Pius IX in 1847, this decoration aims at people who distinguish themselves by their activities in civil sociability and can serve, as example to others, and can also become future benefactors to the Apostolic See. Justino Maria Aparicio Guterres, Plenipotentiary Ambassador Extraordinaire to the Holy See for the Democratic Republic of Timor-Leste is Honours Graduate in Multicultural Studies from Victoria University, Australia, a Master's Degree in Thesis in Anthropology from the University of Melbourne, Australia and a Philosophy Doctor candidate in Southeast Asia Studies of Faculdade de Letras da Universidade do Porto, Portugal.From 2001 to 2006 was lecture of Introduction to Anthropology and Sociology, Major Seminary of Saint Peter and Saint Paul and also lecture of Timorese Cultural Studies at the Instituto Católico de Professores Primários em Baucau. On the 21st of May 2007, Justino Guterres presented credentials, becoming the first Timor-Leste Ambassador to the Vatican.